Name of the project member who has defined the Test Execution. An option to either start or resume the execution depending upon the status of the previous executions will be available. As parameter the priority and any other custom parameters (fields and their values) set for this Test Execution. For individual test suite covered in Test Execution, the details of cases under it covering individually test case name, and estimated execution time, will be shown on clicking the suite's title. After pre-execution screen on selection of either Start Now, or Resume option, test run screen is displayed. 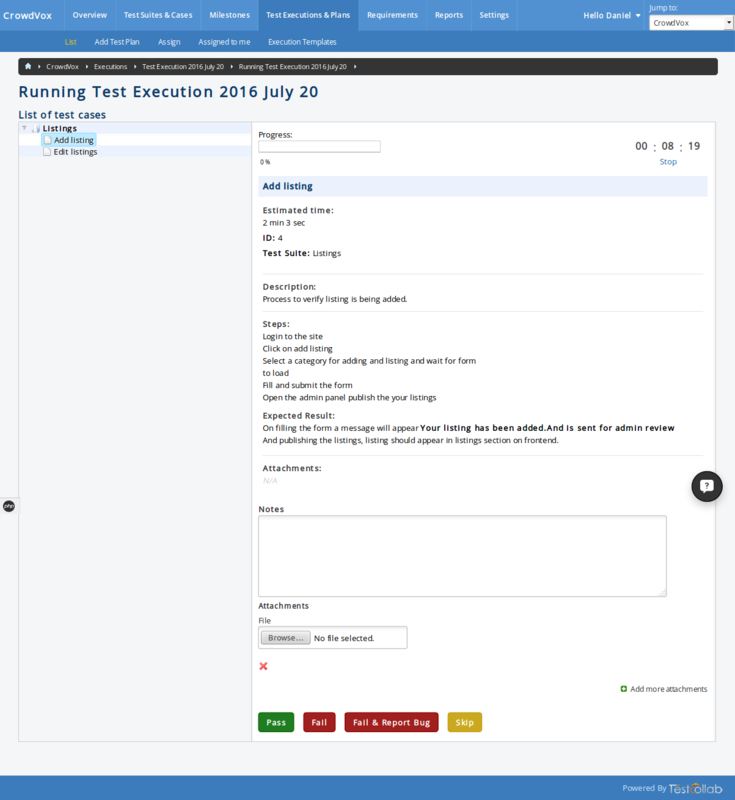 If sequential execution / popup-window for execution is enabled then while user is executing/running the tests, a separate window to manage the running tests and provide his feedback on individual test case back to the Test Collab application, would be shown. 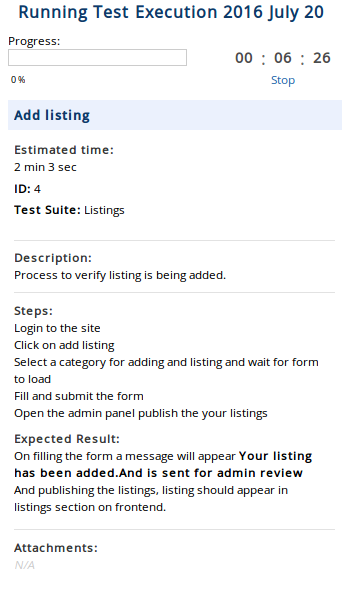 Since this screen is shown on a separate small window it will not hinder the execution process for the test. If sequential execution / popup-window for execution is disabled then the same window will be used to let the tester provide his feedback. This provides an option for tester to move back and forth between the executable test cases by directly selecting the same from suites tree. 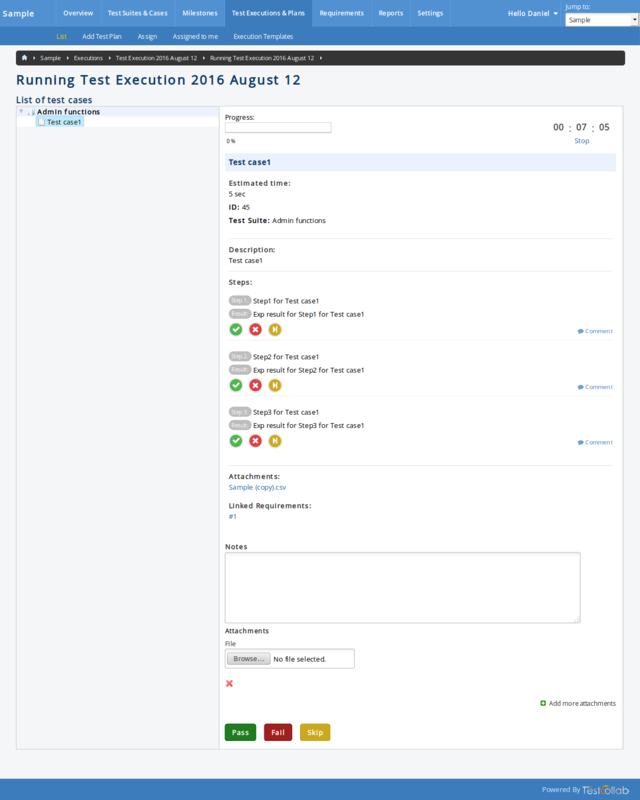 User has the option to stop / resume the time logging for execution of this test case. Executions when separate text fields for steps and their expected results have been enabled for project. If while creating the project you have enabled separate text fields for steps and expected results then the execution window will allow you to mark each step as passed / failed / skipped moreover tester can also leave comments for each step individually. If email notification for action(s) performed here has been enabled by administrator, then the same would be sent.